the FTC guidelines. All prize fulfillment will be provided by Sponsors. Good Earth Beauty Products are natural, organic, and not tested on animals! Read more about Good Earth Beauty Products here. 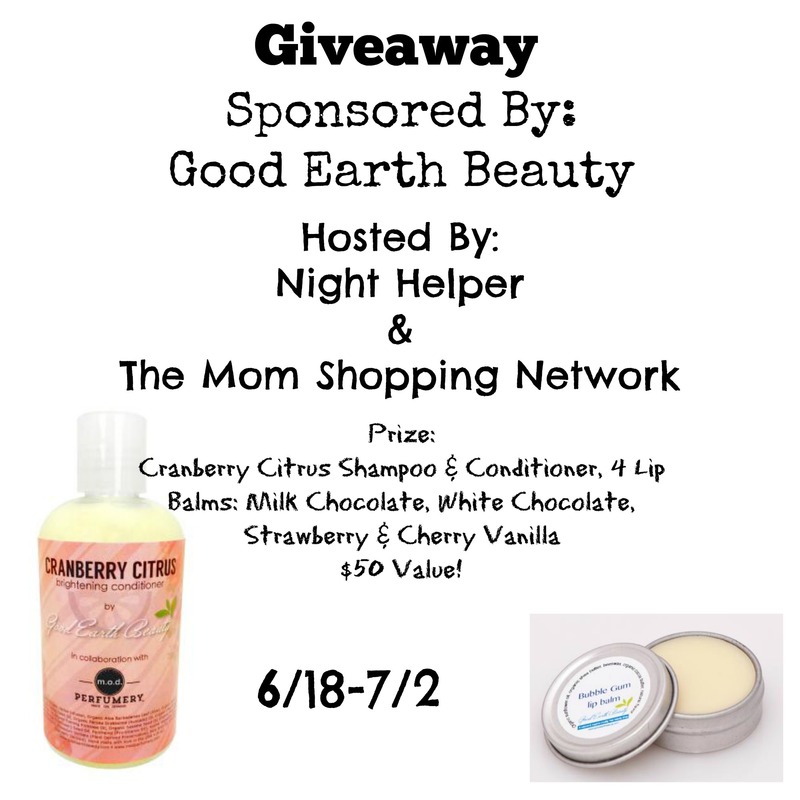 Enter to win a prize pack from Good Earth Beauty Products that contains Cranberry Citrus Shampoo and Conditioner, and four Lip Balms in flavors Milk Chocolate, White Chocolate, Strawberry and Cherry Vanilla. I am looking forward to trying the Cranberry Citrus Shampoo. It osunds likeit will smell just lovely. The cranberry citrus hair care products sounds awesome and I'm looking forward to trying them. I am most excited to try the Cranberry Citrus Shampoo and Conditioner. Sounds awesome! I'm looking forward to trying the Cranberry Citrus shampoo & conditioner. I want to try the cranberry citrus shampoo. The scent sounds like it would be very nice. I am most looking forward to trying the lip balms, as my lips tend to be dry. I am most anxious to try the strawberry lip balm. I am most anxious to try the cranberry citrus shampoo and conditioner. I love it when my hair smells fruity and sweet. I'm looking forward to trying the shampoo and conditioner. The lip balms look great. I would most like to try the Cranberry Citrus Shampoo and Conditioner. I really want to try the White Chocolate Lip Balm! I would love to try the Cranberry Citrus Conditioner. I love trying conditioners and I bet this one smells amazing! Shampoo and conditioner! I love hair products! I'd like to try their Wild Soap Bar: Natural Bluebonnet Soap. I was not aware of Good Earth Beauty brand. Thanks for this post. I would love to use Good Earth Beauty Mascara - Natural. I think that the Shampoo & Conditioner is the one I am most excited about. I have been on a mission to find the perfect one that has amazing scent, thus far I have failed to find the perfect product. So, this may be it! I most want to try the strawberry lip balm. I am most looking forward to trying the Cranberry Citrus Shampoo from Good Earth Beauty products. I am most looking forward to trying the Cranberry Citrus Shampoo.